Allergy Advice: Contains Milk, Whey, Soy. Keep away from sunlight, high temperature and humidity. Consume as soon as possible after opening. Ingredients: Maltose (35%), Sugar, Glutinous Rice (20%), Stabiliser (E1442), Chocolate (4.9%) (Sugar, Palm Kernel Oil, Palm Oil, Milk Powder, Whey Powder, Cacao Butter, Vanilla Powder, Soy Lecithin, Stabiliser (E471), Flavour), Strawberry Powder (1.0%), Food Colouring (E162), Preservative (E200). 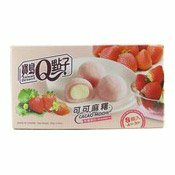 Simply enter your details below and we will send you an e-mail when “Cacao Mochi (Strawberry) (可可麻糬草莓风味)” is back in stock!